The Etsy IPO will be priced after market close today, likely around $14 to $16. The Etsy (Nasdaq: ETSY) share price, if it follows a typical first-trading-day pattern, will jump from there – but will have trouble maintaining any first-day pops. The company's B Corporation values will determine where the Etsy share price goes after its April 16 debut. The B Corp. status defines Etsy's mission and culture. The certifications are awarded by B Lab, a non-profit that, according to its website, "uses the power of business to solve social and environmental problems." B Corp. certifications are given to firms that meet certain social, environmental, transparency, and accountability standards. Some B Corp. initiatives are providing employees bikes for their commute and composting food wastes. B Lab reports that there are 1,257 B Corp. companies across 38 countries and 121 industries. 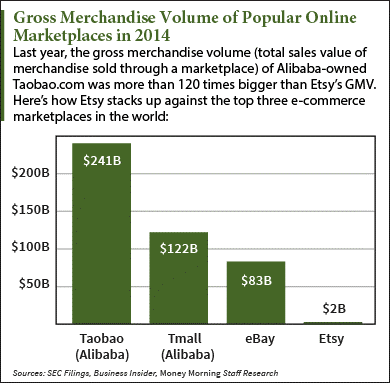 Etsy will be the largest B Corp. company to go public. But these wholesome values threaten Etsy's profit potential down the road. Company management considers shareholder and community well-being paramount to Etsy's success. Etsy wants investors to embrace its mission to be both socially conscious and financially successful. The Bottom Line: Like every other stock, there are a variety of factors that can influence the Etsy (Nasdaq: ETSY) share price. While GMV and users are important, Etsy's dedication to upholding its B Corp. standards jeopardizes its profitability.